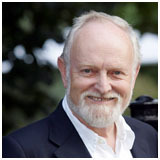 Richard Henry Simpson Stilgoe OBE DL (1961), born 28 March 1943, is a songwriter, lyricist, entertainer and broadcaster. After studying music at Clare College, where he was a Choral Exhibitioner and a member of the Cambridge Footlights, he landed a role in a West End musical and made his name as a musical entertainer on various light entertainment television programmes. His subsequent broadcasting career has embraced both radio and television. As a lyricist, he has worked on the phenomenally successful musicals Starlight Express and The Phantom of the Opera. Among his numerous awards are two Tony nominations, the Monaco Radio Prize (three times), the New York Radio Festival Gold Award and the Prix Italia. In 1998 he founded the Orpheus Trust, which provides performing arts experiences to young people with disabilities. He was made an OBE in 1998 for his charitable work and services to music. A keen cricketer, he is President of Surrey County Cricket Club and a former High Sheriff of Surrey.